Independence Day is on Tuesday this year. The company where I work (I'm a contract employee) had decided to shut down Monday as well, resulting in a four day weekend. As they used to say in Colonial times ......... "Huzzah!" The weather for tomorrow is looking dicey, at best; but not Sunday. Sunday is supposed to be sunny and about 91F (32C). Sounds like a perfect day to go activate a POTA. Monday and Tuesday will most likely be preoccupied with yard work, so Sunday will probably be the only "play radio" day. I'd like to go activate an entity that I've never worked before. I was thinking maybe KFF-1618 Hacklebarney State Park. A good friend of mine from my college days used to go there all the time; but I never have been. Like any other State Park in NJ, it should have plenty of picnic tables to operate from, I just hope they're next to some really tall trees. Remember how I posted about Field Day starting as a "gully washer" as my friend Bob W3BBO describes it? Remember how I posted about how there was a tornado in Howell, NJ, which is about 15 -18 miles SouthEast of me as the crow flies? Here's some video - this is what the weather was like here from around 4:00 AM to about 8:00 AM. This is why I was thinking Field Day was going to be a washout. Field Day is over - what's next? 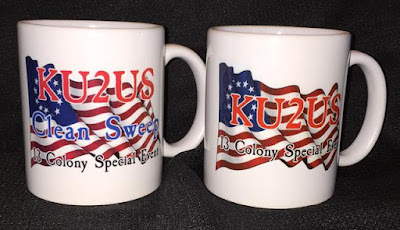 The 13 Colonies Special Event, that's what! 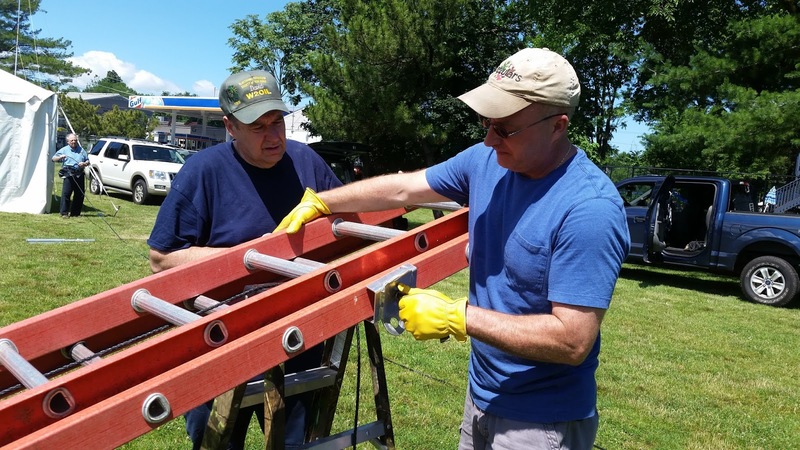 Every year, around Independence Day, a group of volunteers come together to put the 13 Original Colonies on the air to celebrate our Nation's birth. This year will be no different. This year, you can purchase your own colorful 13 Colonies coffee mug! (What's ANOTHER coffee mug among friends, eh?) These are VERY nice and feature the Betsy Ross flag or the Stars and Stripes and the Declaration of Independence. 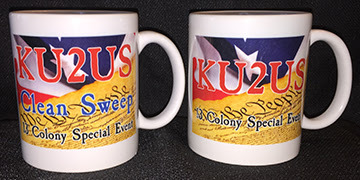 Even though we have more coffee mugs than you can shake a stick at in the W2LJ household, I'd find room for one of these - especially if I managed to get a Clean Sweep. I have a certificate from two years ago, all nicely framed and hanging on my shack wall - I really don't need another. But one of these mugs? I'd be happy to sip my morning cuppa joe out from one of these bad boys. As a side note, not too far from where your author lives is a small little place called the Middlebrook Encampment. This is where the Continental Army was stationed in 1777 and again in 1778-1779. It was here that the Flag of the United States of America was officially flown for the first time for the benefit of the Continental Troops. 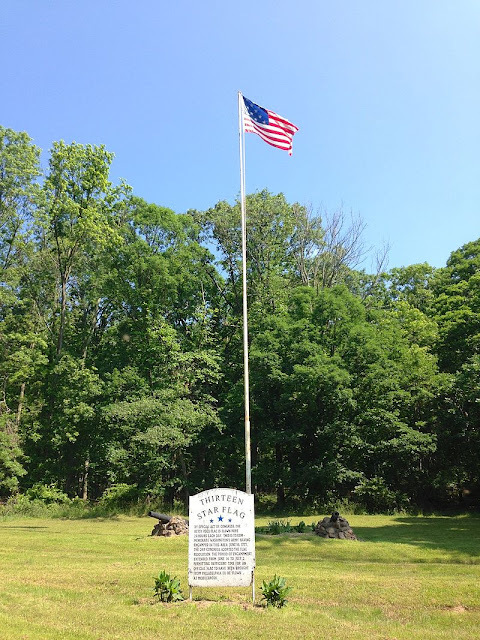 To memorialize this, by a Special Act of Congress, the Middlebrook Encampment is the only place in the USA where the original 13 Star flag is allowed to fly, 24 hours a day, 365 days a year. Now you know why New Jersey is known as "The Crossroads of the Revolution". A lot of very important stuff happened here some 200 + years ago. Remember this if you ever see the subject come up on Jeopardy. You can credit W2LJ when you look like the trivia expert in front of your family and friends. Ya gotta love Field Day ! As Howie Rose, the broadcast radio voice of the NY Mets says, after a baseball victory .... "Put it in the books!" Another Field Day has been relegated to the pages of history. For better or worse, with all it's trials and tribulations, frustrations and failures and successes, you just have to love Field Day! As Saturday dawned, the outlook was none too good. First, a little background. Our house is older, having been built in the 1920s, according to the inspection report we had done as part of purchasing it, back in 1998. As such, the concept of air-conditioning was unknown back then, Central air was installed sometime before we bought the house, but it's an older one zone unit. The thermostat on the main floor controls the entire house. The bedrooms are on the second floor, so in the Summer, that floor is a bit warmer than the rest of the house. Each of the three bedroom has one of those cylindrical room fans to help keep the comfortable during the warm months. "What's that got to do with anything?" you may be asking yourself. As I awoke Saturday morning at 6:30 AM, I heard something just a bit louder than the hum of the fan. It took a few minutes for my groggy brain to figure out what it was. Rain! It was coming down in buckets - as Bob W3BBO would say, it was a real gully washer! I only heard one or two rumbles of thunder, but the National Weather Service is currently in Howell, NJ (which is all of about 15 miles or so Southeast of me) investigating whether or not tornadoes had touched down. This was not an auspicious start to Field Day weekend. Before I could head out to the field, I had a few chores and the grocery shopping to do, so I got those done, first. As fortune would have it, as I was in the check out line at the grocery store, about 90 minutes later, I happened to look out the window to see bright sunshine and blue skies! It looked like Field Day was going to be a bit soggy, but at least dry for the balance. 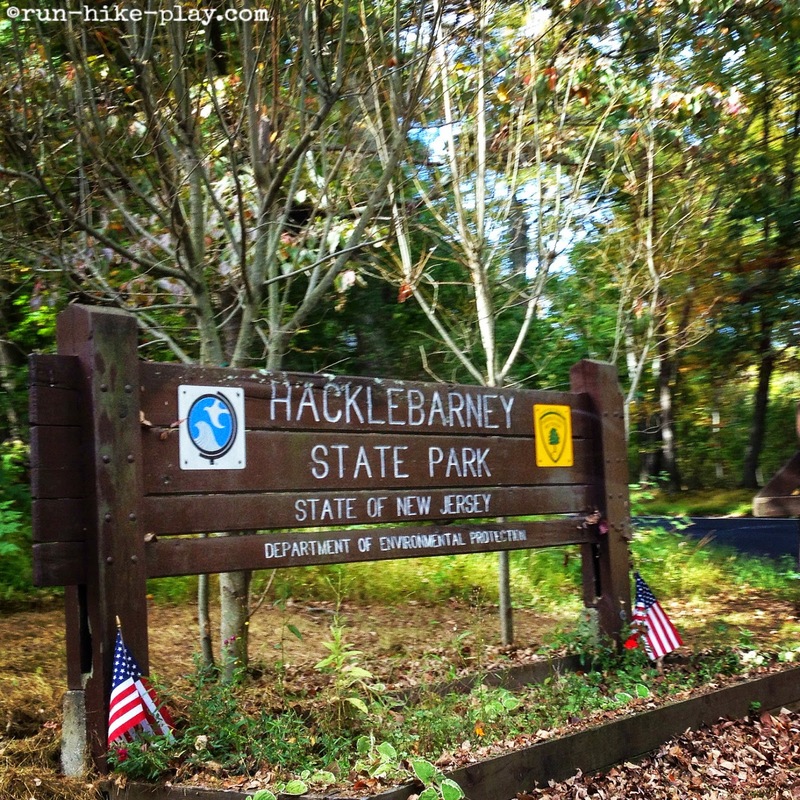 Taking care of the last home and family business, I loaded up the Jeep with the things that I needed to; and I headed out for Spring Lake Park just a few minutes after 10;00 AM. Yes, the ground was soaked, but it wasn't muddy. It ended up being a minor inconvenience and not an impediment. 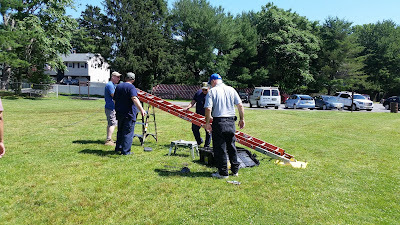 Set up went rather quickly with only a few "Murphy incidents", but as this was NJ2SP's fourth Field Day effort, all became pretty much routine. After helping to build the beam, I got busy with other antennas as the "tower" was being loaded and raised. 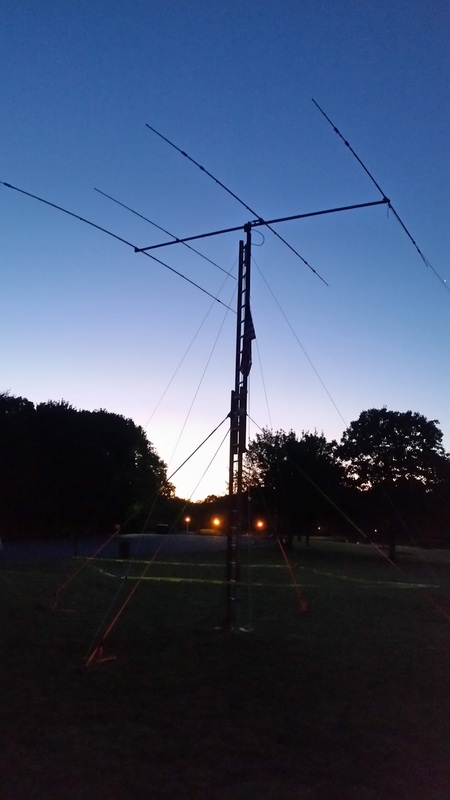 It took a while to figure out the logistics, but I got Marv K2VHW's G5RV up in the trees for the CW station. 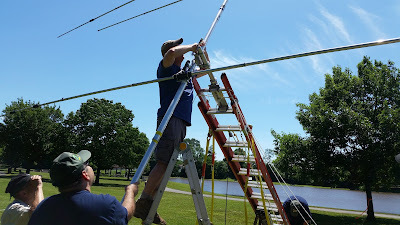 The beam was for the SSB station and our third HF station was hooked up to Dave KD2FSI's 80 Meter Inverted Vee. I didn't get a photo of it. I will next year. The base for the 80 Meter Inverted Vee is a small cargo trailer that hitches to the back of KD2FSI's van. 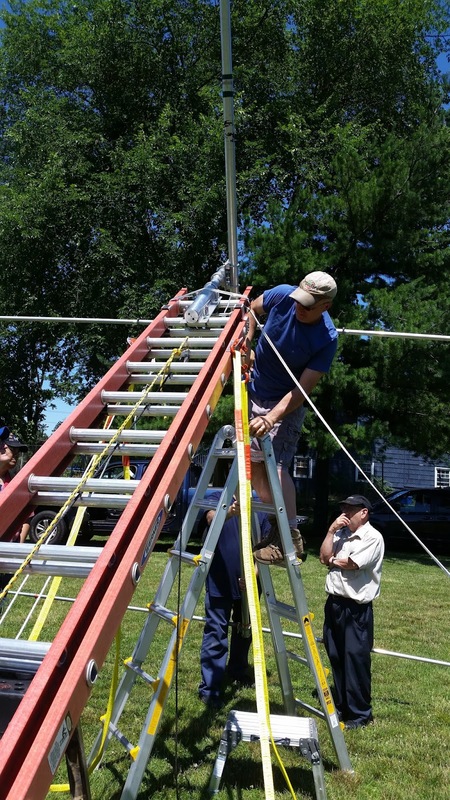 It supports a 30 foot (or so) collapsible mast, which in turn supports the wire. This innovation that Dave came up with is perfect for Field Day and other portable ops situations. The VHF/UHF stations and the GOTA station were hooked up to other antennas. As it approached 1:00 PM local time, with an hour to go, Dave and I got to setting up the equipment that would be used for making the contacts. 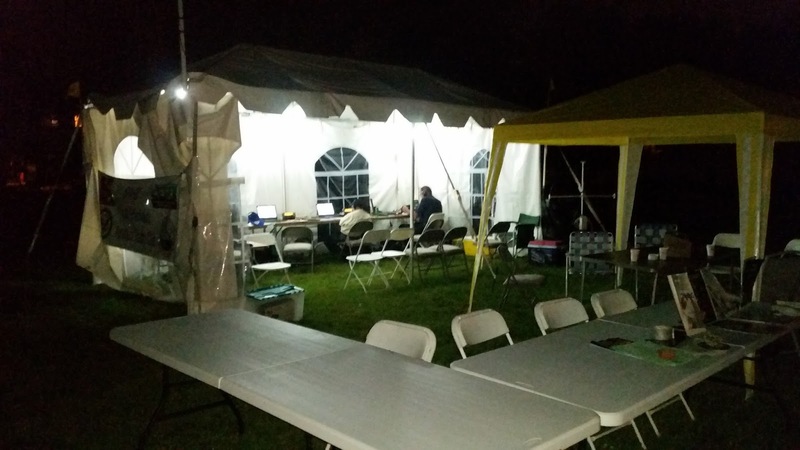 Ron N2LCZ performed his IT magic once again, and had set up a small LAN (oxymoron - "small LAN" .... think "Jumbo shrimp" Heh.) so all our logging laptops could be connected to one desktop which served as our logging server. This was the only thing we use commercial power for, the entire weekend. 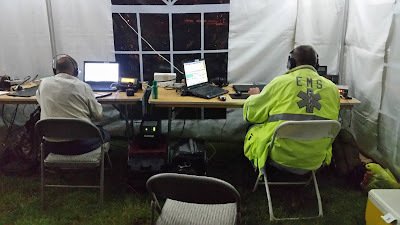 The Field Day rules state that as long as the computers are not connected to the radios, by any means, and are not in any way, shape or fashion used for controlling the radios, then you can hook those up to commercial power and not lose your status as having operated on emergency power. The gas station next to us once again allowed us to hook up an extension cord to one of their outlets, powering up our computer system. At 1:45 PM we were ready to go. 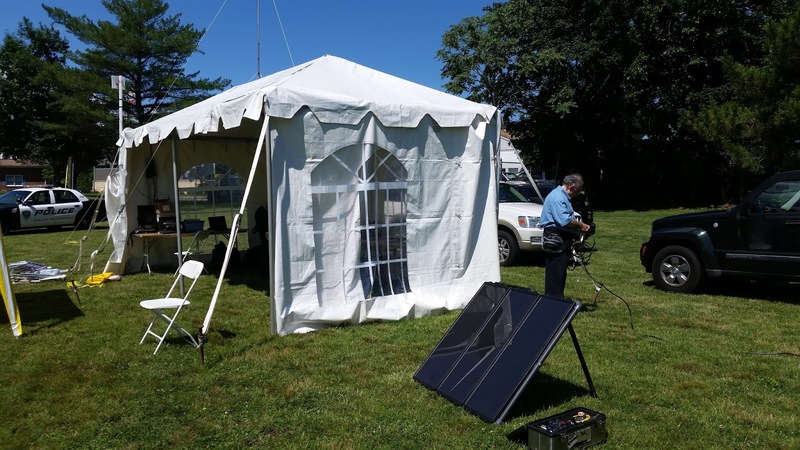 The Elecraft KX3s were at the CW and 20 Meter SSB stations. 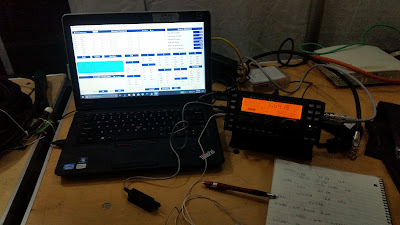 KD2FSI's radios were at the third HF station as well as the VHF/UHF station and the GOTA station. We were hoping for some good 6 Meter openings at some points throughout the weekend. As I turned on my KX3 for the CW station, I was presented with a horrifying situation. Marv's G5RV was giving my KX3 fits. It would load up fine on 40 Meters with an SWR of about 1.3 to 1, but on both 20 and 80 Meters, the best match the KX3 could get was about 6: to 1. That was simply unacceptable and I wasn't about to waste time trying to figure the situation out with only minutes to go. My brain immediately kicked into backup mode and I decided to go with the antenna that so bravely performed at out very first Field Day back in 2014. EARCHI to the rescue! I shot another line into the tree that was already serving as one of the G5RV endpoints and got the EARCH endfed up, posthaste. I didn't even bother with mason's twine and a tent stake. We set the antenna launcher in a safe place on the ground (so it wouldn't get run over or bumped into) and it and the monofilament fishing line held the end fed up, all weekend long. The KX3 was a happy camper, with the autotuner providing a good match on all bands. That included (more or less) 160 Meters, where I was able to make a couple CW contacts. Oh, and by the way, the coaxial stub filters worked flawlessly! I installed them on the CW and SSB stations and there were no interference problems all weekend long. Dave KD2FSI and I also took more care to pay attention to antenna placement this year; so that also helped. 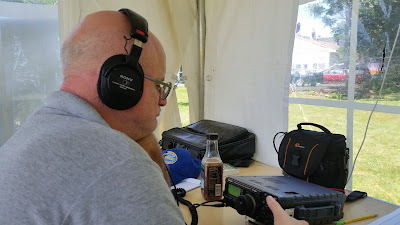 All the radios were able to be manned all weekend long without anyone having to stay off a band for any particular time because of hearing CW or SSB artifacts coming through from a neighboring radio. A tip o' the hat to W3BBO for directing my attention to the use of coaxial stub filters. The highlights of the weekend included the Mayor and members of the Town Council paying a visit on Saturday afternoon. Our ARRL Section Manager, Steve Ostrove K2SO came by Saturday evening for a visit. This year we had the most public interest that we've ever seen, with people coming by expressly to learn about what Amateur Radio is and why we were there. Some parents brought their children to see what Amateur Radio is all about, expressly because of its special relationship to STEM. We also had a few Scout Leaders from both the local Boy Scout and Girl Scout troops come by to ask us if we would come to troop meetings to give a more hands on demo of Amateur Radio. We were happy that the Middlesex County RACES Bureau Chief, John Garmendi N2DV came by for a visit, so that he could see that the Radio Amateurs from the town of South Plainfield are ready and able to assist in any way needed, should the situation ever present itself. The stations hummed this year, throughout. Again, thanks to KD2FSI and his antenna analyzer, he was able to tune the beam and the SSB station was able to go great guns. 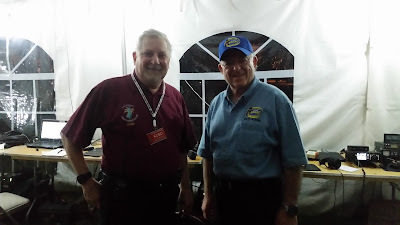 The SSB QSO total came close to the CW QSO total for the first time this year we were able to come close to a 600 QSO total. It did my heart good to be able to look over to the SSB station and watch the guys make one contact after another and actually enjoy operating SSB QRP instead of being frustrated by a balky antenna. Some of the newer Hams that we were privileged to either instruct or test, came by and actually spent some time behind the microphone. It's a good thing to watch them get on the air and actually start to enjoy their operating privileges. 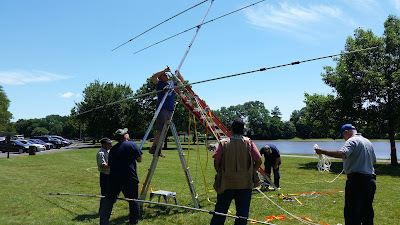 It's one thing to teach, it's another to test; but it's another gratifying experience to watch new Hams get their feet wet and become more comfortable with Amateur Radio. I will not be surprised in the least if they're back next year, not for only a few hours, but for the whole shebang. Dave Vadney W2OIL and Dan Vadney KC2YRC from our sister club, the ETS of NJ, came by and stayed with us for a large portion of the time, Once again, they were humongous helps during set up and tear down and on Saturday evening, they supplied us with the most fantastic home made meatball sub sandwiches for supper. And this year, they both got the chance to operate, too. 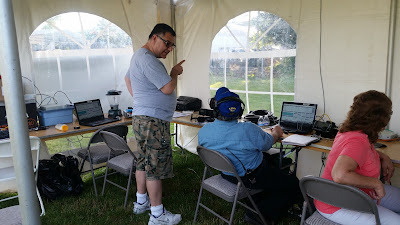 It was nice to see them actually get a chance to sit behind the microphone, play radio for once, and get the chance to add to our QSO total to boot. As usual, ever since my Piscataway Amateur Radio Club days, I stayed the whole 24+ hours with the exception of a break for Mass attendance (some things are even more important than Amateur Radio!). As it got late through the night, and into the wee hours of the morning, I took a few breaks to get away from the key for a few minutes. Never for too long, though, because the mantra that kept playing itself over and over again in my head was, "The contacts aren't going to make themselves. ", and that kept me going. Marv K2VHW who is normally the co-operator of the CW station had some issues that kept him away from the key for his normal amount of time. I tried to take up the slack by myself as much as I could and I think we came close to hitting our normal CW total for this year. I got all of about two hours sleep on Sunday morning, finally just crashing out on one of the camping chairs. Last night I slept the sleep of the dead and I'm still pretty groggy and useless this morning. I'm on my second cup of coffee (in which I seldom indulge, but is a necessity today), but I'm pretty happy with the results of the weekend. We made a record number of QSOs by far this year, with SSB station finally doing what it should have been able to do all along - and all were made with 5 Watts or less. A good time was had by all, and once again, some new friendships were made and a lot of older ones were solidified. Thank you God, SPARC, ETS of NJ and friends for a fantastic Field Day weekend! As the day goes by and I am returning to somewhat normal, I am horrified by all the spelling and grammatical errors that I see that I have made and am correcting them. However, I'm still glad that I posted while all of this is still in the "Very Fresh" memory bank. Looking at the weather, Field Day in and of itself may not be too bad, but set up is looking to be a soggy affair. Rain tonight, ending tomorrow somewhere around 8:00 AM, as presently forecast. I wouldn't mind it clearing out a little earlier so it drys out a bit more for our scheduled 10:00 AM set up time. The South Plainfield Amateur Radio Club will once again put NJ2SP on the air as "NNJ 3A". 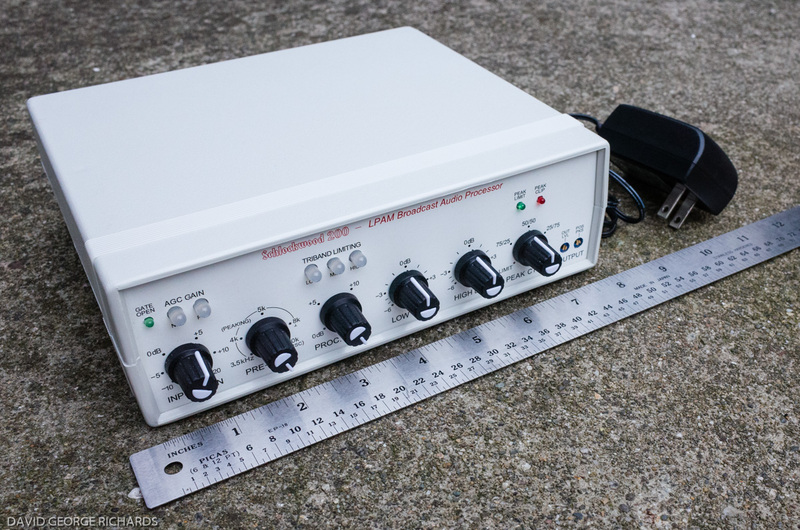 We'll be operating QRP / Battery. We'll have a GOTA station on the air and we'll do our best to get as many bonus points as we can. If you're in the Central New Jersey area, please feel free to stop by. We'd be glad to have you! Look for us in Spring Lake Park on Lakeview Avenue in South Plainfield. We'll be in the big, white tent. "Passing on the respectful culture of ham radio is at least as important as "getting them licensed"." Bravo! That sums up my opinion of Ham Crams. I know they are the rage today, but to be honest with all of you, I detest them! A one or two day session may be enough to pass on the bare bones - but why do you want to pass on only the bare bones? 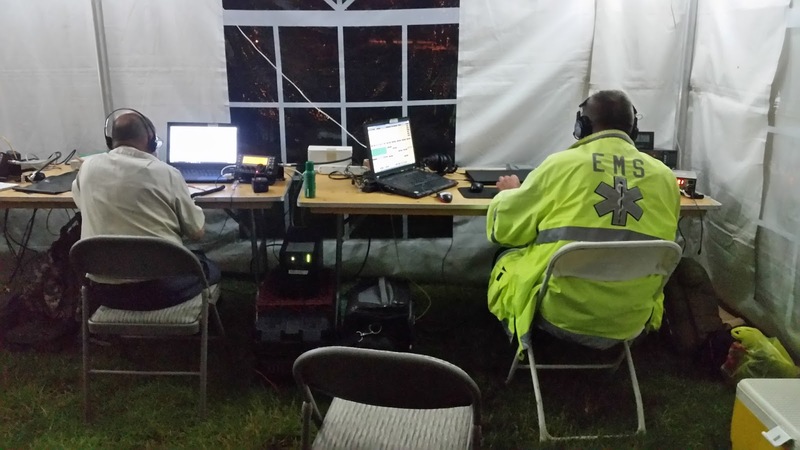 Amateur Radio is more than the sum of its parts. Besides the technical and operational aspects, there's a rich history to pass on. There's also so much that the teachers can pass on of their own experience, so that the students don't make the same mistakes the teachers made when they were "wet behind the ears". You can't do any of that in one or two eight hour sessions. That's NOT Elmering and it's not responsible teaching. Then we wonder why so many newly licensed Techs are losing interest? Why would they stay licensed when no one has taken the time to impress upon them the "magic" of our service/hobby? Let me add something...... as I don't mean to demean Ham Cram study aides. Sites like W1UL's site are wonderful and he has a proven track record. If you want to go that way - fine, more power to you. I think Ham Cram study guides, such as Urb's are a wonderful resources for those who are genuinely dedicated to getting their license via a self study program, or a traditional class program. But if you're going to get involved with teaching in a Ham Cram type session ..... make sure the participants do their due diligence and actually read the material and study before doing a one or two day session. My experience has shown that if they're not really serious about getting a license, the results are just going to be disastrous. I've had a much greater success rate with traditional style Amateur Radio licensing classes. In addition to getting across the needed exam material, you also get the opportunity to get the "flavor" of Amateur Radio across to the students and actually get them even more eager and excited about getting on the air. Additionally, in my mind, the commitment required by attending a multi session class speaks volumes about the intent and desire of the students. Lastly - the process can't end with a newbie Ham walking away with a CSCE. 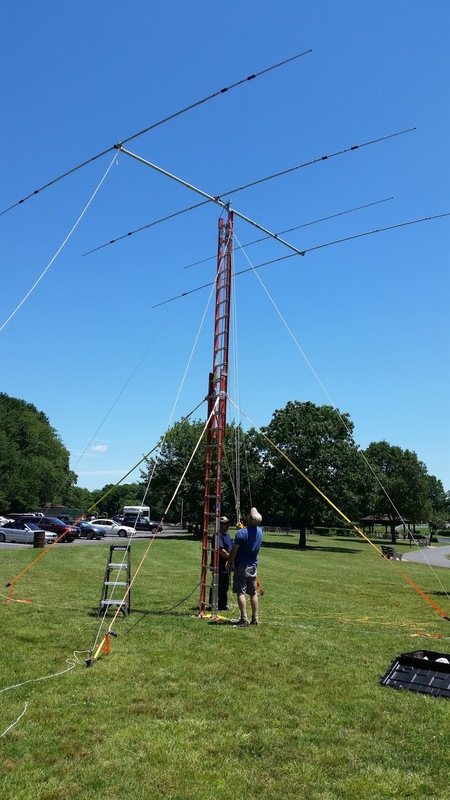 They have to be cultivated into the Amateur Radio community. You have to get them involved in a club and activities where they can ask questions, bounce ideas off people, see equipment before they buy it, etc. Keep in touch with them before, during and after the licensing process - this way, they're no longer students, but also life long friends. Of course, this is all my humble opinion and YMMV. 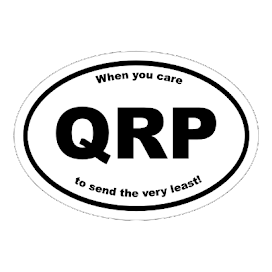 Never participated in a QRP Sprint before? Then try this one! 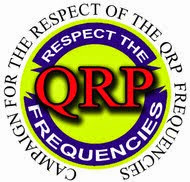 For me, it's more a QRP social event than a contest. I never go in with the idea in my head that I'm going to win - I just like to hear all of you on the air and like to work as many of you as possible. Not into CW? This QRP Sprint has a SSB category. No excuses there! To channel Star Trek - always remember the NJQRP Skeeter Hunt "Prime Directive" - get outdoors, get on the radio and have fun! Nothing more, nothing less. Gentlemen ....... start your engines! The 2016 Skeeter Hunt soapbox is up, here! The 2016 Skeeter Hunt certificates have been printed and are in the process of being mailed. The 2017 Skeeter Hunt rules are here. 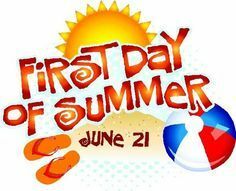 The first day of Summer for 2017 is tomorrow - so start e-mailing your requests for Skeeter Hunt numbers to w2lj@arrl.net now! 1) It's first come, first served - everyone gets a chance at a lower number. 2) There are no "reservations" for specific numbers - no specific "requests" - that dance card was filled a long time ago. 3) Requests for Skeeter Numbers (in the order they were received) will be read starting tomorrow morning and the Roster will be updated as my time permits. 4) You can request a Skeeter Number right up until the day before the event - that means August 19th is the last day that number requests will be answered. 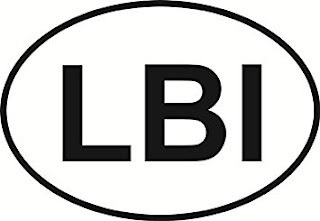 5) Each request will be answered via a return e-mail, If you do not get an e-mail back from W2LJ, or do not see your name and call on the roster within a reasonable amount of time, try again. 6) Please, please, PLEASE include your name and either the state or POTA entity that you will hunting from in your e-mail. The Official 2017 Skeeter Hunt Roster can be found here. Have at it guys and gals - hope you have as much fun with this as I do! 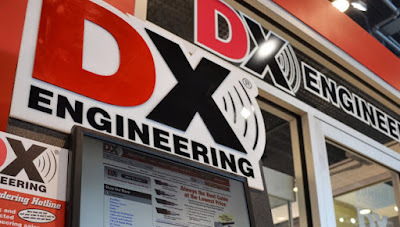 A big shout out and "Thank You" to the fantastic folks at DX Engineering ! The package with the stickers came in today's mail! Woot! K2WO, W3BBO, KA9EAK, KK6RUH, and NX1K - your envelopes are being mailed in the morning. If anyone else wants one, these puppies are $2 each, which covers the cost of the sticker, envelope and postage with a few pennies to spare. You can send a snail mail to my QRZ address or send funds via Paypal to w2lj@arrl.net. If you send an order through Paypal, if you don't send your address - please note your call sign at the very least so I can look you up on QRZ. They say Memorial Day is the "unofficial" 1st Day of Summer. That may be true; but in Skeeterland, we wait until the "official" Official 1st Day of Summer to start issuing NJQRP Skeeter Hunt numbers. That day is coming up fast - next Wednesday, June 21st is when Skeeter numbers for 2017 will start being dispensed. All you have to do to get one is to send an e-mail to w2lj@arrl.net and one will be sent back to you in a confirming e-mail. Be sure to include your name, call sign and either the state you'll be operating from or the POTA #. Now I know some of you faithful Skeeters are probably reading this and are thinking, "Wait a darn sec, there, LJ! Where's the Soapbox page from 2016 and where are our certificates? Huh? What do you have to say about that? Huh?" Mea culpa, friends! I'll readily admit that I was tardy on both counts. However, the 2016 Soapbox page is now up at http://www.qsl.net/w2lj/index%20page%209 and your richly deserved certificates are in the process of being printed. I hope to have them in the mail, no later than this weekend. And hey, the timing isn't so bad, is it? You can read the soapbox and make plans for this year, while reminiscing over last year! There's also a new Fabook group devoted to the Skeeter Hunt - https://www.facebook.com/groups/175763746290252/, if you're so inclined to join. So to answer one last question - why new Skeeter numbers every year? Why aren't they good for life? The reason for that is that I like to give everyone the opportunity to get a low number. Those seem to be the most coveted. For various reasons, not everyone is able to participate from year to year - family commitments come up, business trips happen, vacations happen. It's not fair to lock up a low number because of that - so they get issued to folks who really want them and have every intention of using them. That being said, if you're not certain that you'll be able to participate - DON'T LET THAT STOP YOU FROM GETTING A NUMBER !!!! I'd rather numbers go un-used than not issued at all. Sometimes things come up, but then there are times that potential conflicts get resolved and it's better that you have a Skeeter number than not! Lastly, I kinda fibbed on that statement about Skeeter numbers not being good for life - at least in one instance. Let it be known, throughout the kingdom of Skeeterland, that from henceforth, W2LJ will always be lucky Skeeter #13. 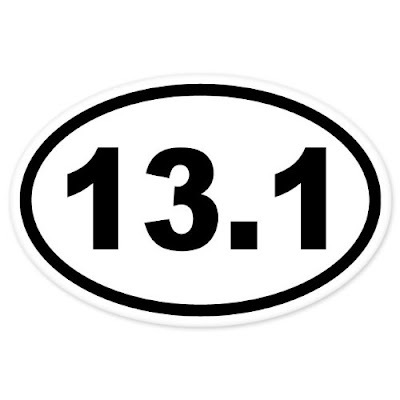 There are some superstitious folks out there, who have specifically asked me to make sure they are not issued #13 - so I've solved that little predicament by assigning it to myself in perpetuity. Many thanks to Chris KQ2RP for posting the heck out of this on his blog and Facebook - the new DitDit.fm podcast. I finally got around to listening, and this is great! Produced and hosted by Bruce Pea N9WKE, the podcast is dedicated solely to all thing about Morse Code and Morse Code related subjects. This is perfect for those of us who are dedicated CW geeks. I'm not usually big into listening to podcasts (that's why it took me a while to start listening); but "DitDit.fm" and "The QRPian" will be on my listening list for as long as these guys keep the podcast fires burning. Bruce? You had me in Episode One when you said, "I don't even own a microphone!" Yesterday was the inaugural Cookie Crumble QRP contest and even though I got to spend only a limited time behind the key, it was great fun! The contest lasted from 1:00 - 6:00 PM, but I was not able to sit down behind the KX3 until nearly 4:45 PM. Yesterday was my Sunday to volunteer at the soup kitchen. So I had it all planned - or so I thought! Early in the morning, I set up my antenna and portable station out at the backyard picnic table so that everything (except the radio, which I left inside the house) would be ready when I got home at 4:00 PM. The problem was I didn't get home at 4:00 PM. The meal yesterday was meatball sandwiches along with potato salad, chips and a dessert. Everything was going fine until we discovered that the marinara sauce at the bottom of the two big cooking pots had burnt. Have you ever had the honor of being the one chosen to clean burnt marinara sauce from the bottom of two big cooking pots? To say that a sandblaster would have come in handy is an understatement. Since I didn't want to be there all evening,and miss the contest entirely, I let the bottoms of the pots soak in super hot water and liquid dish detergent for about 10 minutes. Then I used a metal serving spoon to literally scrape off as much of the burnt sauce and gook as I could manage. Then I followed that up with Brillo and some good ol' fashioned elbow grease until the posts were clean. No mirror finish; but you'd never be able to tell what bad shape these pots were in unless you use an electron microscope. I hurried home, grabbed the KX3, paddle and earbuds and hooked everything up to the antenna and battery that were already positioned and waiting for me. I started out on 20 Meters and heard a lot of SKCC Weekend Sprinters, but no Cookie Crumblers. I did work Jimmy K4YFH in North Carolina who must have been confused when I relayed that I was "NR 173" as he came back to me "49C" which is my SKCC number. I decided that 40 Meters might be the better band on which to find Cookies and that proved to be true. 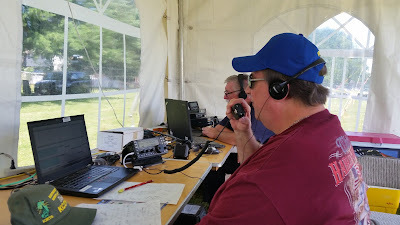 I worked Dan KA3D, Ralph KW8G, Bob W3BBO (who was on his newly acquired HW8. It sounded great, Bob! ), Ken N3CU (Cookie Monster), Emily KB3VVE, the Cookie Queen herself, Dave K2FI and finally K3SVA Gene (Cookie Monster). So in a total of an hour and 15 minutes I made 8 contacts. Nothing to set the contest world on fire about; but I had fun and that was the main point! It was in the 90s (30s C) yesterday, and after the long Winter and extended damp and chilly Spring that we have had, sitting in the sun with a warm breeze blowing felt just oh, so good! That I was playing radio at the same time was just icing on the cake, or perhaps, sprinkles on the cookies - if you prefer! The setup was my usual. The antenna was the PAR End Fedz 40/20/10 held aloft by my 31 foot Jackite pole. The battery was not my normal portable ops lithium battery, as I opted to use my Field Day PowerWerx SLA. The paddle was the Palm Pico. Thanks to Emily KB3VVE and Tim W3ATB for coming up with another gem of a QRP Sprint. Tim has already posted on Facebook this morning that Emily has decreed that the 2nd Cookie Crumble will be on Sunday, June 10th, 2018. If you didn't participate this year, you deprived yourself of a very, very good time. Make sure not to miss it next year! If you're a QRPer and would like one, you can send $2 to my QRZ address - that will cover the cost of the sticker, an enverlope and postage. 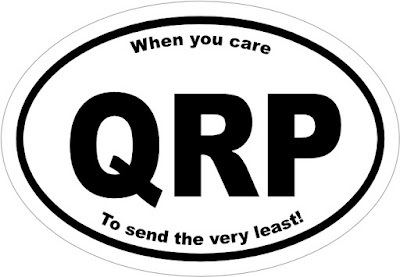 This is being offered as a service, and to make our presence as QRPers known - this is not a moneymaker, nor any kind of donation request/fundraiser. 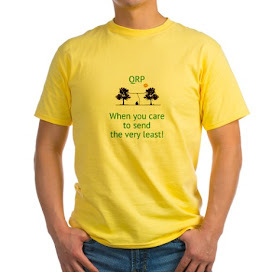 If you'd rather avoid sending for one via snail mail, you can send $2 via paypal to w2lj@arrl.net. I should have them in a week or so. Regarding yesterday's post about the weather and a possible POTA activation on Sunday. 1) It's the second Sunday of the month and that's the Sunday that I volunteer at the soup kitchen. 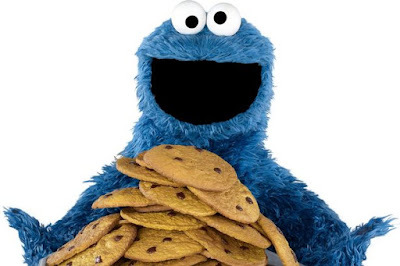 2) This Sunday is the inaugural "Cookie Crumble Contest" - a new QRP Sprint, which was the inspiration of Emily Saldana KB3VVE and Tim Carter W3ATB. It runs from 1700 to 2200 UTC - or from 1:00 PM to 6:00 PM EDT. I get home from the soup kitchen around 4:00 PM, so I can participate for the last couple of hours. This promises to be an exciting Sprint with a couple of "twists" including contacting "Cookie Monsters' for extra bonus points and "Burnt Cookies" which will actually lose you points! That's a new concept that I've never heard of - but this is meant to be "a fun, low-stress contest that builds friendship and improves operating skills." So, IMHO, that's a unique twist that won't bother me in the least, if I happen to stumble upon a "Burnt Cookie". 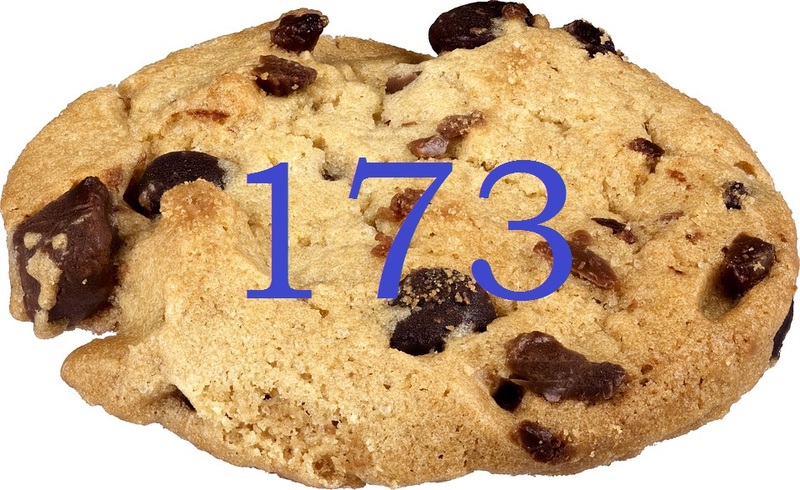 Make sure to sign up for a Cookie Number - W2LJ is Cookie # 173. "If you don't like the weather in New Jersey now, just wait a few days." Today may be damp, chilly and raw - but wait until the weekend. Sunny and hot! It looks like we'll be traversing from April to July in the space of about 4 or 5 days. The bright side is that Sunday just might end up being an ideal day to do a POTA activation. If I get enough yardwork done on Saturday, that is. I have to finish weeding and mulching the front yard landscaping before I can go out and play. Saturday was a bit of a disappointment. I was planning on going to the OMARC hamfest - which is held by the Ocean and Monmouth Counties Amateur Radio Club. I thought I was free and clear to go; but then I was informed that there was a CERT call out for a 5K race and a 1 mile fum walk for a charity in town. Fun or duty? I mulled it over for about 1/2 a second, and pulled out my CERT gear and headed towards the race marshaling point. We deployed to our positions about 1/2 an hour ahead of time in order to position the barricades needed to block off the streets 15 minutes ahead of the starting gun. And it started to rain. Thankfully, my CERT poncho was in my CERT backpack, which is always in the car. To be honest with you, I will never figure out some people. I was positioned one on of the side streets (Joan Street) off the main course, which was South Plainfield Avenue. It was my duty to prevent cars travelling down Joan Street from entering onto South Plainfield Ave. I had two barricades blocking access, as well as my car pulled sideways in the street. People were still driving up to me, sticking their heads out their windows, and asking "Is the street closed? Can I get through?" I was so tempted to say that I was just standing in the rain, with my car blocking the street "for my health"; but instead just smiled and explained that there was a 5K foot race going on and that the roads would be open again in an hour. Thankfully, the rain abated for the race itself, and about an hour later, I was able to secure my post and go home. 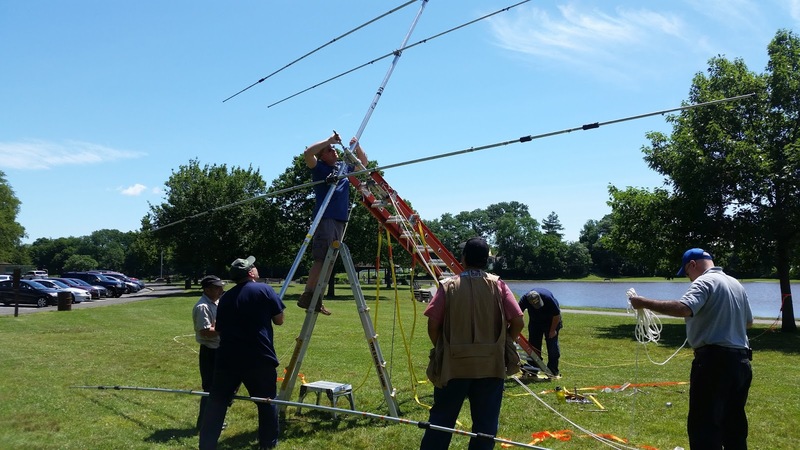 The hamfest was scheduled to only last until Noon; so it was too late to make the trip to go down towards the shore. There were too many chores to do anyway, so it was probably better that I didn't go. On another note, I've been getting a couple e-mails asking about the 2017 NJQRP Skeeter Hunt. Yes, it will be held again this year on Sunday, August 20th. Look for an announcement to be made here within a week or two and for the NJQRP Website to be updated with the photos and soapbox comments from last year's contest, soon. I'll also let you know when it's time to send your e-mails requesting Skeeter numbers; and what the theme is, for this year.